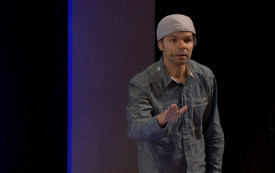 Steve Colman is an award-winning spoken word poet, playwright, producer, and director. He co-wrote and co-starred in the Tony Award-winning Russell Simmons Presents Def Poetry Jam on Broadway and co-conceived and assistant directed Sarah Jones’s Tony Award- winning Broadway hit Bridge and Tunnel, which was originally produced by Off Broadway by Meryl Streep. He led the team, along with Spike Lee, that brought Lemon Andersen’s critically acclaimed solo show County of Kings to the Public Theater. He was the inaugural poet on HBO’s Def Poetry. Through his creative collaboration with Sarah Jones, Colman developed multiple projects for television, film,and stage, including A Right To Care, Jones’s solo performance piece about racial and ethnic disparities in the American health care system. Colman began performing poetry at the Nuyorican Poets Café on Manhattan’s Lower East Side. He won the National Poetry Slam championship as a member of the 1998 Nuyorican Poets Café slam team. The Nuyorican Poets Café honored him with the Fresh Poet Award in 1999. He has toured the world with his popular brand of poetry and storytelling and is the co-author of Burning Down the House (SoftSkull Press), and Russell Simmons’ Def Poetry Jam on Broadway and More (Atria).